As a freshman at UT, Brother Terk attended a gathering of pro-Israel students to hear from guest speaker Charles Pulman, an attorney. Pulman discussed some of the pro bono legal work he had done for StandWithUs. 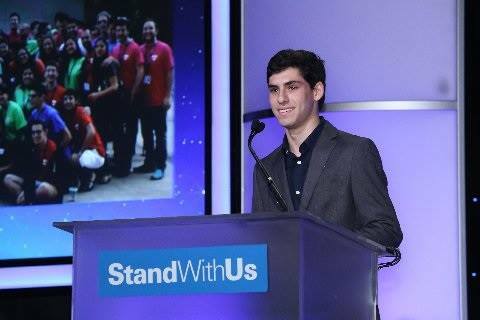 “I started to realize he may have been connected to my case, and it was unforgettable when I finally confirmed he was.” They exchanged contact information and Brother Terk was invited to speak at a StandWithUs fundraiser aimed at expanding the organization in the south. Brother Terk grew up in a family that emphasized upholding its roots and connection to Judaism, so it came as no surprise that he chose to attend UT with its strong Jewish community and opportunities to be an Israel activist. He currently serves as the Gamma Deuteron chapter’s Israel Engagement Chair and hopes to keep Jewish students involved and engaged while realizing the significance Israel has on them.